Attention: Outbound Campaign Users in the UK: OfCom has issued revised policies to address the “persistent misuse of an electronic communications network or service” that take effect March 1, 2017. 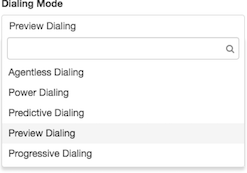 It is recommended that when using outbound dialing campaigns that result in terminating calls in the UK, only Preview Mode should be used in campaign settings. Any other dialing method used by outbound campaigns may not comply with the new standards. For more information about this change, please see OfCom’s official site: https://www.ofcom.org.uk/. Add resources required for this campaign mode, or identify existing resources to reuse. Set Number of Outbound Lines to the total maximum number of lines that this outbound campaign can consume. The campaign won't place calls greater than the maximum allowed. This setting gives customers control over outbound resources by limiting the number of lines available on a per-campaign basis. This property is not required, but it is important to understand how it affects allocation of lines, regardless of whether or not your campaigns assign values to this setting. When Number of Outbound Lines is left blank or set to zero, outbound lines are divided evenly between campaigns. For example, if you have 300 lines and 2 campaigns, each campaign is allocated 150 lines. For a scenario with 300 lines and 3 campaigns, 100 lines is reserved for each campaign. When one or more campaigns has a configured threshold, lines are reserved as configured, with any remaining lines split equally among campaigns whose threshold is zero or blank. For example, if you have 300 lines, 1 campaign configured to use 290 lines, and a second campaign set to 0 or left blank, the first campaign would have 290 lines, and the second 10. Or, if you have 1 campaign configured to use 290 lines, and two campaigns left blank or set to zero, the first is allocated 290 lines and the others 5 lines each. If campaigns reserve more lines than actually exist, an error will happen at campaign start time since it is not possible to allocate more lines than actually exist. If this happens, reduce the number of outbound lines to prevent the total from exceeding the actual number of lines available. You cannot assign a call analysis response set that transfers to agents to an agentless campaign. Agentless campaigns do not use agents. If you select a response set that transfers agents to an agentless campaign, a validation error appears. Likewise, you cannot assign to an agentless campaign, a response set that does not have a 'Transfer to Flow' response action, since an agentless campaign requires that action. From the Contact Filter List box, optionally select the contact list filter that this campaign should use to limit the dialing to contacts that match the filter. For more information, see Contact list filters view. Note: The Caller ID phone number takes precedence over the external trunk setting, even if the Address Override Method is set to Always in the Calling section. Optional. Enable Always Running if you want the campaign to continue running even if there are currently no contacts in the contact list. This option is useful if the contact list is dynamically updated from another source. Optionally sort the contact list by column before dialing begins. For example, if your contact list has an Amount_Owed column, you could sort the list to call people who owe the highest amount first. Under Advanced > Contact Sorting, select a contact list column in Sort by. Select a Sort order: ascending (default) or descending. If the sort column contains numeric information such as a telephone number or monetary amount, enable Field is Numeric. Contact list sorting takes place at campaign start or campaign recycle. If you add a contact while a campaign is running, the new contact is dialed but is not included in contact list sorting until the next campaign recycle. Click the plus sign to sort by additional columns. You can sort up to four contact list columns, with the first sort taking the highest precedence. Note: An error message appears if the new campaign exceeds the maximum limit count of 1000. Delete old or obsolete campaigns as needed and click Save again to complete the new campaign configuration.